Sep 22, 2009 6:40 AM– Skin is our defense against many kinds of harm. Nails, hair, scales, claws, hooves, horns, quills, feathers, and beaks all grow from skin. They are mainly made of keratin. Keratin is a tough, flexible, waterproof filament made in special skin cells. 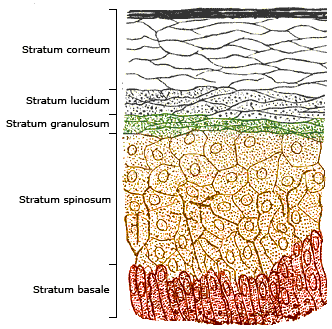 The surface of skin is a very thin layer of keratin. It is made by the layers under it, and moistened with fats and waxes. The keratin, fats, and waxes keep water inside the body and foreign particles, such as bacteria, outside. House dust is mainly skin. The skin surface is constantly wearing out and being replaced. One square inch of your forearm loses about 8,400 cells every hour. Soap strips fats and waxes from the skin, but within six hours, the stripped skin's protective ability returns to half of normal. Within six days, it returns to normal. Our skin has bacteria living on it—and in it. Counting live cells in one square inch, forearms have been measured at 65,000, the abdomen at 260,000, underarms at 3,200,000, scalp at 6,500,000, and hands at 30,000,000. 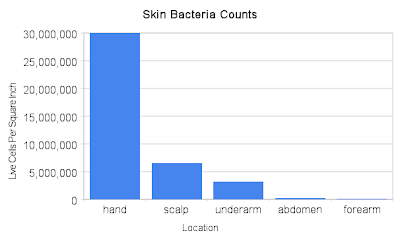 Not all bacteria found on the skin cause illness. Some even set up house, living in permanent colonies attached to the deeper layers of our skin, without causing harm. The surface of our skin also picks up and drops off visitors—germs, both bacteria and viruses—when we touch things. These visitors are often the ones which cause illness. Some die very quickly in the open air, but others can survive for long periods of time. They are also easy to wash away. This means that many illnesses can be prevented by hand washing. It is especially easy to pick up and drop off germs when you touch moist surfaces—such as moist skin, food, and any damp or wet object. Plain soap and water picks up germs without killing them, so they can be rinsed away. To be effective, you should rub all parts of your hands for at least 30 seconds, and then rinse thoroughly. Soaps with germicide kill germs while the soap picks them up. They are used like plain soap. Alcohol hand sanitizers kill germs by dissolving their outer parts. Use products containing 60–95% ethanol. Soiled hands can prevent the sanitizer from getting to all of the germs, so wash hands first if possible. Rub all parts of your hands until completely dry. Alcohol evaporates quickly, so apply enough (about one-half teaspoon) to keep your hands wet for at least 30 seconds. The risk of alcohol fire is very low, but be sure to rub until completely dry, and keep wet hands away from sources of flame or static sparks. Alcohol hand sanitizers with germicide work like plain alcohol sanitizers, but also continue to kill germs for a short time after your hands dry. Soaps and sanitizers have been studied carefully to see which is best. The studies have found that not all germs are alike. Plain soap and germicide soap are about equally effective for preventing common illnesses such as colds and the flu. Washing hands followed by hand sanitizer is more effective than washing hands alone. Some germs are naturally resistant to alcohol or to some germicides. If you are trying to prevent illness caused by a specific germ (such as hepatitis C) ask a doctor which germicide is most effective. Some viruses are learning to adapt to germicides in soap. Some scientists are concerned that the use of germicides will cause these viruses to become common. Use soaps and alcohols that contain skin conditioner, to prevent skin irritation and dryness. To help children rub all parts of their hands for enough time, teach them to wash while they sing “Happy Birthday” twice. Sep 11, 2009 7:00 AM–Conservatism at its heart is the champion of the accumulated wisdom of many generations, protecting it from the new wisdom of the current generation or of individuals. At its best, it preserves our institutions from ill considered changes. At its worst, it interferes with wise innovations and preserves evil in the form of social institutions such as American slavery. Liberalism at its heart is the champion of personal liberty, protecting it from fascism, whether despotic or the tyranny of the majority. At its best, it rights past wrongs and comes to the aid of the defenseless. At its worst, it acts without foresight and creates evil in the form of unintended consequences of social reforms such as rent control. Laws (in the US) are written in English. The existence of legalese is a fiction perpetrated by lawyers in an attempt to both enhance their monopoly and to obscure the facts. The sentence as quoted is ambiguous. Unless it is further constrained by surrounding language it does in fact give entities the option to choose not to enforce the law. Thank you for responding. I love knowing someone is actually reading my stuff. My answer turned out to be too long to relegate to a comment, so I wrote this followup article. I won’t argue that lawyers never obscure facts. But legalese is not a conspiracy to make understanding the law impossible, and the sentence is not ambiguous. Specialists invent technical terms so that they can communicate clearly and efficiently with their peers. It’s human nature. Any discipline will develop jargon. Jargon greatly improves the chances that specialists will understand one another. At the same time, it greatly increases the risk that laypeople will misunderstand specialists, because of the reuse of ordinary words as technical terms. So there is no conspiracy to confuse laypersons. It just so happens. It is true that specialists can and do write in lay language. There is a big market for books and articles that popularize technical subjects. A long enough book can explain almost anything. But specialists writing for their peers do not write in lay language. They save a great deal of time and confusion by using jargon when writing for peers. A law needs to be efficiently written and have a unambiguous meaning. Jargon has developed among lawyers which makes that possible. Like any jargon, its precision comes at the cost of confusing and misleading laypeople. So it is popularly ridiculed as legalese , just as I did in the original post. But that does not make it a deliberate attempt by lawyers to obscure, any more than computerese is a deliberate attempt by computer professionals to obscure. A standard English dictionary or English grammar can be unhelpful in understanding jargon. Jargon follows its own rules. The rules for understanding legal jargon are very well developed and well documented. The qualifying phrase that enforces this section unquestionably applies only to other political subdivision by the rule of last antecedent, one of the basic rules of legal jargon. This means the supposedly ambiguous qualification does not refer to a municipality or to a county, at least. They are unambiguously obligated to post signs. Then, unless the context indicates that an other political subdivision that enforces this section is obligated differently by the law than a municipality or a county (which it does not), the remaining supposed ambiguity is eliminated also. Several different rules might apply, and they all come to the same conclusion. The rule of ejusdem generis restricts the general descriptor other political subdivision that enforces this section to the same class as the other items in the list. The other items simply identify political entities which are known to have the enforcement duty, rather than assigning that duty to them. Therefore other political subdivision that enforces this section is also simply identifying an entity, rather than having the more general effect of assigning a duty. The rule of noscitur a sociis determines the meaning of other political subdivision that enforces this section by association with the other words in the phrase, from which follows the same conclusion by the same reasoning as above. The presumption against absurdity rejects the alternate interpretation, that political entities other than municipalities and counties would have discretion in the matter, considering that the law was passed specifically to establish a uniform statewide rule, and also preempts all local ordinances, rules, or regulations that are inconsistent with specific provisions of this section adopted by a political subdivision of this state . Sep 1, 2009 7:00 AM–Some media outlets have published misleading news stories about the new Texas school zone cell phone law. Some reported that communities might not post signs at a school, which would let drivers off the hook. The cause of the the misleading stories is that Texas law is written in legalese---a language very similar to, but not to be confused with, English. This says that the local authority that is responsible for enforcing this law at the school is also obliged to put up a sign at the entrance to each school crossing zone. A municipality, county, or other political subdivision that enforces this section means the local authority that is responsible for enforcing this law . Shall post a sign means is obliged to put up a sign . So it is a fact that the local authority is obligated to post signs. That is why local authorities all over the state are posting signs. It has also been reported that the local authority cannot enforce the law where a sign is not posted, and that the sign must notify the driver that there is a fine for disobeying, and that existing local laws are preempted by the state law. Those are true facts. To sum up, there is now a uniform Texas school zone cell phone law. The local authority must post signs, and the driver must obey the signs unless they are missing. What part of “Ph’nglui mglw’nafh Cthulhu R’lyeh wgah’nagl fhtagn” don’t you understand? The more you cry, the less you’ll pee. Relish the love of a good woman.